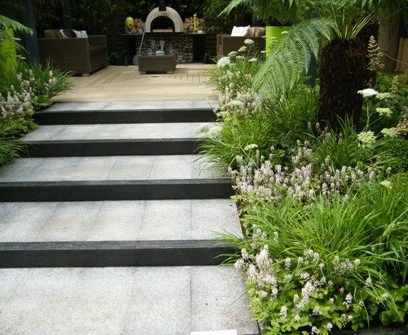 Garden surfaces can make or break the design of a garden. I have been dealing with a few gardens in the last few weeks where the clients have not always found it easy to select the best surface. Factors to consider when selecting a surface are the style of the garden and the house, cost and whether a porous surface is required or not. When I go and visit a new client I always take careful notes of the style of the house because the best result is achieved when the paving on a patio directly outside the house matches the style inside the house. If I see beautiful cream tiles in a contemporary styled house I would often recommend a beige sawn sandstone product which is smooth. A beautiful finish is created when this smooth looking stone is laid without mortar joints and in a stretcher bond style. The seamless paving matches the simplicity of a contemporary style. In a more traditional garden I would recommend Indian sandstone which is laid in a random pattern. The paving is slightly uneven giving it a natural texture and mortar joints are used.Each paving slab often has a slightly different colour and suppliers often give a choice of stone in shades of either greens, pinks or greys. Lawn does not always need to be the choice for a soft ground cover. Artificial lawn is becoming increasingly popular in gardens which have children, dogs and shady areas. The latest artificial lawns even have a few brown threads in them to replicate a natural looking lawn. I would recommend a qualified person installs the lawn as DIY jobs can look cheap and unrealistic. I frequently see clients install expensive ground surfaces stretching wall to wall. A far more attractive garden can be achieved when planting areas are incorporated into the paving or along the boundary of the garden. Other surfaces to consider are wooden or composite wood decking, pavers, gravel or resin bound surfaces. Why not contact me to advise you about the best and latest materials for covering the ground in your garden.